This magnificent colorful menorah sculpture is made out of metal and formed with a laser cut, then hand-painted in beautiful multicolor. The base is a simple rectangle with nine cut-outs that fit classic Hanukkah candles. Pomegranates, leaves, and birds are painted around the candle holders and leaves are painted all over the sides of the base. 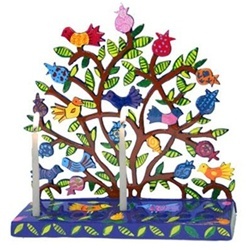 Behind the candle holders, a beautiful tree is blooming with many colored birds and pomegranates on its branches. It is a beautiful piece of art that will bring a very special light to your Hanukkah festivities.